The day dawned fine, I washed the outdoor BBQ setting table and chairs, put out the tea towels on the benches in the shed and set up the tea and coffee, took the milk, sugar and teaspoons down to the shed and moved the BBQ into position, turned on all the LED overhead lights in the shed, fired up the Raspberry Pi wi-fi, sat back until closer to the scheduled start time. At about 11:30am I fired up the BBQ, and cooked the snags and onions. On time at midday, the crew started arriving and partaking in a cold drink and a snag on a piece of bread. This session was the first for two new attendees. We had Paul for Noosaville, and Quentin from the northside. 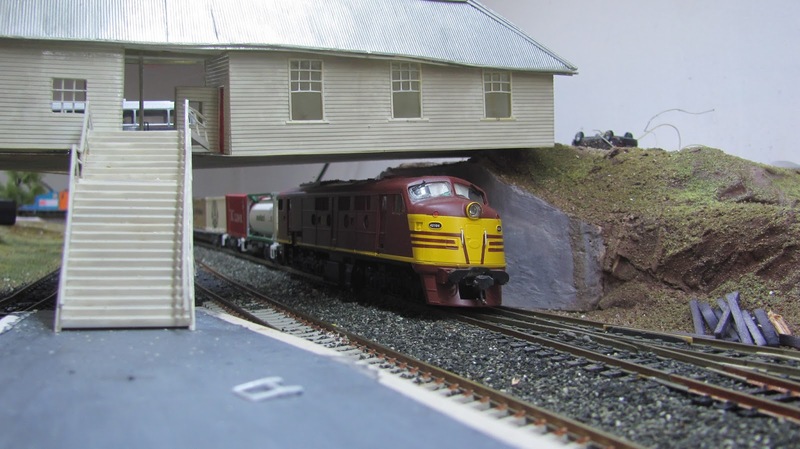 Quentin in a member of our Club, a great NSW modeller and the provider of many photos of Murwillumbah cement silo. Paul has an interest in Casino and has provided hundred of photos that I have scanned that show much lost detail from around the late 80's and early 90's of Casino and surrounding areas. These are truly gems. Most of the rest of the crew were regulars, with still a lot more regulars unavailable, due to family time take precedence as it should at this time of the year. 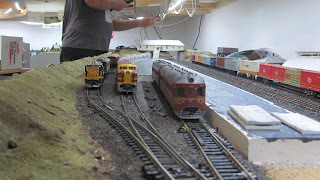 Arthur made his way to North Coast Control, while I took Paul for a tour of the layout. The rest grabbed their headsets, note board for hanging around their neck to attach the timetable and shunt lists and pen to. Soon after getting under way, Quentin also rocked up. However, he did not get a tour, but watched for a while before he dove into the deep end. I know that Quentin through no fixing whatsoever, pulled two Murwillumbah branchline trains for the roster. Quentin has a desire to model this branch based on Byron Bay. Upon starting the Operating Session, it dawned on me that I may have undertaken a bit too much partying in the lead up, as I forgot to re-install a set of point in Clapham Yard that I was updating. So that rendered track 3 out of action at the northern end. The set of points just north of that for track 4, kept aligning to the mainline and send half the train one way and the other half the other. Not a good situation. Whoops! You can see where the Whoops is! This point when set for the curve, just resets itself back to the straight direction. I think the spring has gone for a holiday. Also at the start of the session, there was a short in section 5 of the layout. I could not work out what was causing the short in that section. I turned the section off, changed a few sets of points and turned the session back on and it all came good. But it was 5 minutes of immense frustration, as I was running trains yesterday. I will have to look into this further. I was very happy that first few comments were that the layout was running well. That was until a few points were not set correctly and trains run through them and you guessed it, some wagons ended up in the dirt. 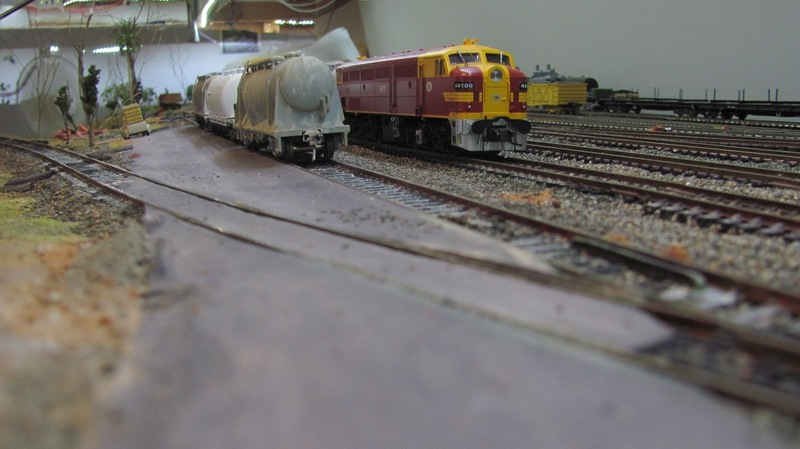 There were a few wagons that uncoupled during the session, and these occurred right next to a wagon that has recently been added into a train consist. It also dawned on me later on during the session that No.11 the branch line shunt train, had all the wagons facing the wrong directions. So it was not reshunted between sessions. I must add that text to the next timetable iteration, to run the train around the Grafton Reversing Loops at the end of the previous session. Luckily it was my train, so when I got to Cassino, with nothing else there I broke it up into the four different sections of the trains and put them back together in the correct order. Doing so with my shunting across from the back platform road into the Yard, held up two trains and I got a few cross words delivered to me from those drivers. You know what they say – Refer Rule 1. Early on in the session, the North Coast Control got himself into a stalemate. He had two trains sitting in Rappville Loop heading north, and he had four trains (five if you count the railmotor in the dock) sitting at Cassino. He did not know he was in such trouble. I had to help him get out of it by advising what train to move first. The two trains at Rappville Loop - the branch line oil and the ballast train due to go to Cassino and shunt back to the Bonalbo ballast siding. Cassino, with a stabled container in the Yard, a steelie is sitting in the platform heading south, and a fruit train in the Loop also heading south. The Tamper is in the back platform road. The NCC have permission for the Oil Train to take the back platform road and close up to the tamper, as the Container train made its way further north also freeing up space in the yard. The unfazed North Coast Controller - Arthur. The crew certainly gave it to one of the drivers. There were a few incidents called out. So the call went out, who was the driver – sure enough we could all pick out who it was. A few cement wagons left laying around between Old Cassino and Lismore. This driver was given a bum train with a new wagons continually causing mayhem. That wagons has been bad ordered and will be fixed tomorrow. 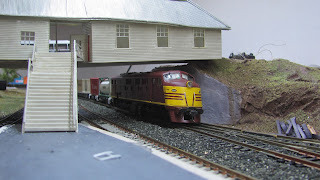 There was one major incident, narrowly avoided at Glenapp Loop, as the Brisbane Limited was barrelling through the mainline at warp speed when the driver realised he needed to stop to exchange the staff- just as there was a southbound Container train coming sedately towards him to take the loop. It was a herculean effort in stopping the Limited before it ran out onto the mainline and into the container, but I think the hand of god may have been involved. I must admit, that as crib time drew near at 3:30pm, the amount of trains running went to zero real fast. In a fraction of a second, the whole shed was emptied. I have never seen people move so fast. At that time, as we had a mixture of Tea, cold drinks and a cooling ale, the black clouds were rolling in from the south and thunder could be heard in the distance causing those in attendance to glance at their phone and check out the weather alerts. They had about a hour before the storm was to hit just south of where we were. So after crib, the whole crew departed home after a most successful session. The stats were that we ran 21 completed trains and there is at least one more left on the layout (the one I was driving) that is just one section short of completing its timetable. I plan to complete a few tasks before the next session, like install the point that I forgot to install. I have four timetable cards that have notes written on them detailing what wagons might need their couplers attended to. I know that another wagon (the last wagon on the banana train) lost its trailing coupler on the last wagon as it was shunted into the Banana siding at Murwillumbah as part of the last train movement before crib. The banana train sitting in the Murwillumbah banana siding with the troublesome KD on the last wagon. 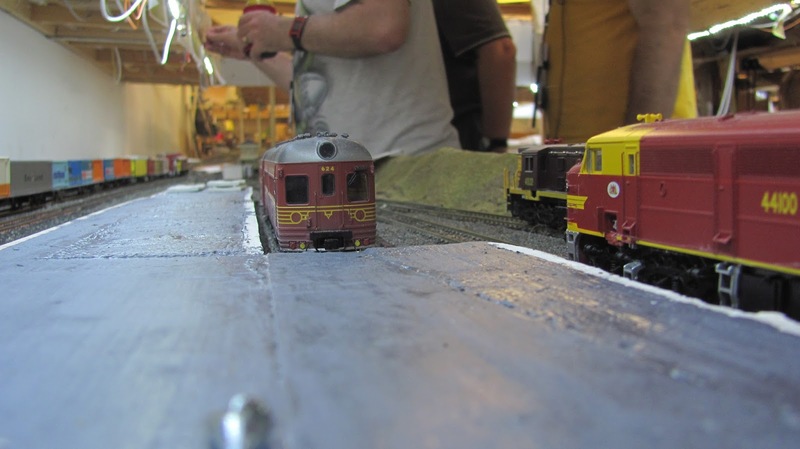 The Cassino aisle can get busy at stages with shunting occurring at Murwillumbah and lot of other trains running across the various decks. A northbound container heading up the Cougal Spiral. Some more crew around Fairy Hill Loop and heading into Kyogle. I think this is when John lost his train (the Tamper) somewhere on the layout and he could not find it. The better side of Greg. Me thinks someone might have changed a point under the train as it was taking the loop at Rappville. Most of the crew excited at completing the December Operating Session at Cassino. Our intrepid reporter (Shelton) was active again today. He took these shots below during the session. No.1 the Container to Fisherman Islands heading across the Richmond River Bridge. The Container taking the yard at Cassino, as the crew then go to crib before another crew takes over for the run to Fisherman Islands. The Murwillumbah Cement train taking the back platform road at Cassino before heading towards Lismore and loosing two wagons, before placing three in the Storage siding at Lismore before continuing onto Murwillumbah. The cement heading past the Down morning Mountain Goat that will head to Border Loop later on in the session. The cement leaving Cassino from another angle. The cement had just placed three wagons in the No.2 Storage Siding before heading towards Murwillumbah. It was about here that Shelton was told that he left two wagons on the mainline between Old Cassino and Lismore. I think this is Park Road Sidings. The locos are heading from Loco Pilly after refueling and supposed to couple to the other end of the train before departing south towards Grafton. However, Shelton coupled up to the wrong end of the train, before righting his wrong. We love him! A graffitied wagon from one of my trains at either the paper train Park Road Sidings or a fruit train at South Brisbane Interstate. A southbound container in the platform at Lismore crossing the Murwillumbah bound empty banana train. It will drop four banana wagons in the No.1 Storage Siding. The day could not have run as well as it did without the help of the boss who purchased all the food, cut up the onions, set the table for Lunch and set out the chips, dip, biscuits and cakes for afternoon tea. What a wife! Thanks Beautiful. By the way, we are hoping for another Operating Session on the Australia Day weekend. As the year draws to a close, so do the various Operating Sessions for the year that I either attended or hosted. Yesterday I had the pleasure of travelling over to Anthony’s Border District for his last Operating Session for the year. He has run 11 this year, the start of a regular session each month. I have been able to attend 8 of those sessions. These have been great. Since I have been attending this sessions, I have met some great Victorian/South Australian modellers. 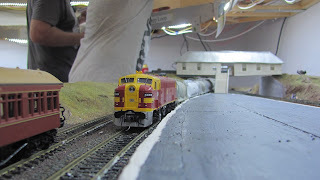 I have seen some great modelling and I have learnt quite a bit our those mexican railways and I have had a ball. Yesterday I was Train Control (a job I have had more times than not) while 3 others were dedicated drivers and two were working Tatiara Downs yard. Train Control’s job is to liaise with the Station Master at Tatiara Downs for traffic from Border Junction and other locations further east, as well as locations west of Tatiara Downs; setting the various points and signals etc. I also had the opportunity to run 5 trains. One of those trains was the stonie. While no one was watching, I almost put the van and half of an aggregate wagon almost into the sedimentary pond next to the aggregate loader. Luckily, there were no cameras around and the driver just put the train in forward and everything just ran back onto the rails. No proof whatsoever! I also got the blame for not setting a point correctly, and sending a train into the yard at Nankiva and causing it to derail. The true story outlined in the internal report revealed it was one of the regular recalcitrant photographers, in order to get a good video or still shot, keeps leaning on point actuators and then setting weird routes. So I was absolved of any blame. A really great day. I am looking forward to next year’s sessions. Today I got down to the shed after lunch and completed the last few tasks in preparation for my own Operating Session in a weeks time. I still have some fine tuning of a couple of new shunt trains that I have added to the timetable and that leaves this week to complete that. So this arvo I spent a bit of time fine tuning my two passenger train consists. One gave Greg a wretched time last session. One ran from Grafton to South Brisbane and return, while the other ran from Grafton to Murwillumbah and return. One buffet wagons was sent packing from the Brisbane Limited and replaced with a different wagon. I adjusted both motorail wagons bogie heights at one end by a very small margin. So hopefully those operators that get those trains in the Op Session will not need to pull their hair out. I also tested about 6 new wagons and adjusted their bogies as they were screwed in way too tight. These wagons are relatively recent purchases and have now been swapped for some older wagons in some of my freight train consists. I was also doing some shunting in Clapham Yard adding some wagons onto the rear of one container train and I found one 80’ container wagon that had developed a slight bow at one end. This has also been swapped out, but I can’t find any more 80 footers, so I’ve swapped it with a 63 footer. I also spent some time adjusting the track in Clapham Yard, as next year I plan to add a 5th track in this confined space. This will be a new narrow gauge only track. So I have had to slew the tracks closer together, to make room. I also adjusted one track at a set of points as most wagons were derailing at the track joint. So that is now correct. I have also found one set of Peco points that the spring is not working correctly. I think this might need to be removed and replaced. Unfortunately, it is a point where I have added a dual gauge line on one of the routes. So I might need to find another LH curve point and make the same changes to that point. I have also tasked PK into trialling building a dual gauge point from his Fast Tracks jig. These one by one, will gradually replace my dual gauge enhanced Peco points. Who knows I might even be able to borrow one of his jigs and build one myself over the Christmas break. Next week's blog update will have an update on my last Operations Session for the year. Hopefully I will have plenty of time to take photos and maybe some video. I heard that the recalcitrant photographer will be making a visit up north and we might see some of his photos online soon after the session. I also hope to hold another Operating Session in January around the Australia Day weekend, so I hope to fix any issues that pop up at this one for the next one, in the very few weeks in between. I also expect that in the session around Easter, That I will also introduce some narrow gauge trains to the session. Who knows I might hold a narrow gauge only session. Can’t imagine that it will be two enthralling as I only have three wagons and, by then, one loco. I might have to call in favours from Darryl and PK. I hope all my readers have a great long weekend coming up with their family and friends, celebrating the spirit of Christmas. Merry Christmas everyone. This last week was spent down the Gold Coast with a beach swim in the early morning followed by a pool swim upon return to the unit before lunch and various travels to various shopping centres and other locations in the afternoon. I could not get motivated to start work on my Murwillumbah Cement Silo. I was just happy relaxing, swimming, eating and drinking, catching up on reading various train magazines and sleeping. On Thursday with the cricket on TV, I finally sat down at the table and started looking at the cement silo. I had various pipe work components that I had previously manufactured and that needed to be attached to the silo. So I started on this task, and then BAM – I had my juices back. I started looking at various photos that I had received from fellow club member and friend Quentin that showed fantastic detail of this silo. Looking at some photos showed that there was a safety rail around the tops of the three silos. So I thought I would try and replicate this. I made up some uprights and attached them to the tops of the silos. I then took some fine styrene and attempted to glue this to the uprights to make the railings around the silos. This turned out quite well. I then noticed that there was a walkway between the three silos. So I made this out of various styrene shapes just like the hand rails around the silos. It was then that I noticed that there was a ladder structure with a safety frame around it that made its way up from the roof of the base structure to the top of one of silos. Well, I thought I might be able to make something similar to this. Then it was time to pack up and head off home. Early on this afternoon, I found some commercial ladder and then cut some thin slices of styrene tube to add to the ladder to make the safety cage around the ladder. So I have added the round frames to the ladder, I just need to add the vertical bracings and try and make the landing for half way up the silos. That is a job for next week. Later this afternoon I ventured down to the shed and started the rework on the lights above The Risk. I replaced the brackets holding up the frame. I then screwed the Pelmet to the frame and then took a photos of the lights turned on. They worked just as good as before. The LED lights shining on The Risk and below onto Cassino. I then turned around and looked at the lights for Border Loop. I decided to drill holes for my hanging bolts in the two ‘A’ frames above Border Loop. I then thought about how I would attach my pelmet. I started at one end and then attached the other. I turned the lights on and I’m pretty happy with the results. I think I will bend the rear metal aluminium angle slightly to provide more light to the rear of the hilly area behind the crossing loop. I may also pull the chain in one or two links - making it higher. These methods will allow the light to reach the tops of the rear hills. I can also attach some fishing line to the hanging pelmet and tie it to a point behind the current points where the chain hangs from the ‘A’ frame. This way I can ensure that the Border Loop Pelmet does not swing back and forth with the air coming from the Aircon unit during a running session. It also might allow the light from the LEDs to more completely cover the rear hills. Border Loop looking north - a shadow is currently on the hills but I will fix that. I still have plenty of work to do, in order to prepare for the upcoming operating session. This includes testing and tuning some rollingstock, cleaning the track, create some shunting lists for some new trains and printing off the final timetables for the session. Time is starting to run out. Yesterday was our Club’s Annual Christmas Modelling Competition and Christmas Party. So I ventured over there in the rain and submitted a few entries into the modelling competition. Entries were down this year and only about 5 members submitting entries. Luckily most had multiple entries. At this event we also have a number of Christmas Hampers raffled off. This year we had 13 draws and I came away with a big fat zero. Various members brought along plates of goodies to share and the Club BBQ was fired up and plenty of eskies from home were full of cold beverages. The Club fridge was also offering free soft drinks on the day. A very merry time was had by all in attendance. It was great to see some members and their better halves who do not get along very often to the Clubrooms in attendance on the day. 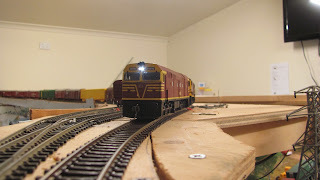 Photos of the Rail set train taken by PK and myself some years ago. A laser cut bridge, designed, assembled and painted on the top deck of the HO Clubroom Layout. The safety handrails along the top deck have been soldered up from brass. I think this received the Structure Award as well as the People's Choice Award. A module that has a curved bridge and a tunnel being entered for judging. This is what people were vying for! The next two photos show the various hampers assembled that were drawn on the day. This week I found it hard to get motivated with the lead up to 7 days of holidays. I still needed to tidy up a few items for the modelling competition. It started off (I think) Thursday night when I needed to get a bow out of wagon. 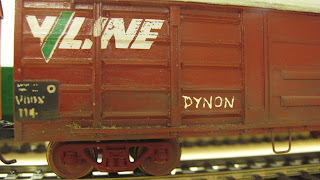 The wagon was one of the two end wagons on my 8 car rail carrying set. I must have used a bit too much glue all those many years ago when I built it and it had a bow like a banana it in. While the wagon runs quite well and is included in my Operating Sessions, it does look quite poor when a banana shaped wagon runs past. So I thought I would try and heat the wagon with some steam coming from a boiling jug and waving the wagon over the steam to heat it up and see if I could persuade the wagon back to a straighter outline. I then tried to bend the wagon back in the reverse banana direction. It seems to have worked. I gave it two shots of steam and left the wagon with a slight weight on it over night. I then gave it another steam the next day and it is almost flat now. I’m very happy with how much of the bow has been removed. I then started looking at my scratch built cream shed that needed a roof before it could be classed as finished. I had already cut two lengths of corrugated card and spray painted them silver many weeks ago. I grabbed the kids pencils and added a few coloured streaks (rust like). It is very slight, but it can be seem on the roof. I then glued these sheets to the roof of the cream shed. What was missing was the bargeboards around the sides of the irons sheets. Well I added two to the sides and and the front of the shed. I used three left over boards from building the shed. Again a suitable outcome was achieved. The last task to complete this week was fix an issue with the Walther’s Medusa Cement Silo. There was a space between the roof and the where the elevator fits in. I think it was about a 3-4mm gap between the two components. So, I cut two rectangular tubes of styrene and but joined them into a square. I then adjusted the height of the square so the elevator joined into the roof perfectly. I then painted the styrene square and then glued it to the roof structure. So now I am happy that this structure is also complete. On Friday I packed up my rail carrying train ready for taking to the Club’s Christmas Modelling Competition next weekend. I also put my now completed cream shed in the same carrying box. I have plenty of activities and shopping trips planned this week, so I thought I would get the modelling comp out of my head. This week with the kids now off school for the year, I plan to sit down and work on my scratch built Murwillumbah Cement Silo. What better to do when there is cricket on TV on Thursday and Friday this week. This model has been sitting around for most of the year with very little activity undertaken on it. This will probably be one of my entries in next years modelling competition. I will post photos of the entries in the Club Modelling Competition on next week’s blog. I had a short day on Thursday this week and when I got home, my package of 5 pairs of male/female plugs for my LED light strings and 6 Amp power supplies had arrived. I purchased them on eBay on Monday morning. They were purchased from a local supplier and you could even select Big-W or Woolworths “Click and Collect” – pretty impressive. So off to the shed and I attached a female plug to my light string above Clapham Yard. Connected it to power and Voila! That works. Clapham Yard lit by its string of LED lights. The view of Clapham Yard looking back south. I then started cutting strings of LEDs for Cougal Spiral. I used a section from each end of the LED string, and then cut two more lengths for the other two runs. I then soldered a red and black wire to the ends of the two cut strings and then joined all the red wires and black wires into another female plug. I then attached that to a power supply and again – Voila – working LED lights. Trains heading north around Cougal Spiral get this view. The view looking south under Cougal Spiral's lights. Next I decided to head down to Bunnings and pick up 2 x 120mm bolts that I will insert into the ‘A’ frames in the roof of the shed. This will be above Border Loop. From the bolts, I will hang two lengths of chain which will be attached to a 5m length of 42 x 18 pine which will hold up my 5m length of LEDs. The power will be fed down to a power supply and another run of lights on the layout will be complete. I need a hand with these to hang them from the 'A' frames. So the next task on the light front is the string above The Risk to be rebuilt. The old string has been taken down. The new brackets to attach them to the wall have been installed. However, upon closer checking, I think the brackets are too small to hold the weight. So I will need to get some bigger brackets similar to what I used above Clapham Yard. The string of LEDs from the old lights has been attached to the new pelmet and I just need a hand to attach it all together. Work in progress above The Risk. I have also been touching up the model entries for the Club Modelling competition on the 12th of December. I still have a bit of work to complete on one building. That should take about 30 minutes, sometime this week. I have also been putting the finishing touches to the timetable for the December Operating Session. I just need to look at the Shunt Lists for a couple of trains and move a few goods wagons around. I still have lots of trains and wagons to check before the session. In particular I need to test run my passenger trains before the next session as well. I also need to check the bogies on a few recent purcahses to ensure that the bogie screws are not too tight straight out of the box. I find most are! So today I got out to shed for an hour before lunch and then for about 4 hours after lunch. The work before lunch was all about just putting some finishing touches on my models for the Club Modelling competition in a few weeks time. I won’t say what I did. After lunch I continued working on the lights above Clapham Yard and the lead into the yard from Acacia Ridge. Firstly I had to attach the last bracket to the shed wall to hold the light frame. One that was done, I cut up my pelmet which is made from aluminium plasterers angle. I cut a small bend in one length and use a complete length directly above Clapham Yard. I punch a nail through one of the side so my screws will hold the angle to the wood frame. Once the holes were punched, I then spray the aluminium gloss white. Once dry, the pelmets gets fitted to the wooden frame after the frame has been attached to the brackets. I then unrolled a 5m length of LEDs and attached it to the aluminium. I then affixed the power supply for this run to under the frame of the layout. I just need a few more of the plugs to hook it all up. This shot shows some of the brackets attached to the shed's wall frame, holding up the lights frame which supports the aluminium plasterer's angle which is my pelmet. The LEDs are already attached. The power cord from my 6 Amp power supply just needs to be attached to the end of the LED by a plug. Hopefully I will get some this week. I used a stationary binder to keep the wiring neat. I have started to do this in a few places on the layout. Once that was complete I decided to cut up the aluminium pelmets for the frame above Cougal Spiral. So the same process was followed and the painted pelmet has now been attached. 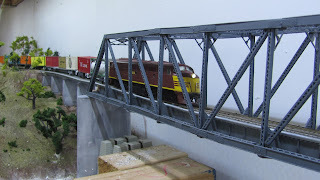 That is complete except for installing the string of LEDs which are already sitting on the layout at this location. Again I need some more plugs to hook the many small runs of LEDs at this location up. Maybe next weekend. This is the frame to hold the LED lights above Cougal Spiral. The LED string is sitting on the layout. In the distance is the old light pelmet above The Risk, that I will replace with a similar light arrangement to the ones I just installed above Clapham Yard. Attention then turned to where I intend to replace the LED run above The Risk. I will build 5 new brackets that will come out from the wall. This then brings me to my least favourite job in the world - finding the studs behind the plaster board. It was then that I realised that I had some magnets stuck to the wall near the North Coast Control desk. I grabbed them and moved then along the wall above The Risk to locate the studs and ‘Hey Presto’ I have a pretty good stud finder. It is good that the magnets just stick to the wall where the metal stud frame is. So I have identified the centre of the studs for the five brackets and next week, I will install the first one, then using my level, ensure that the other 4 brackets are all level. The magnets were so much faster that using a stud finder or even banging on the wall trying to identify a hollow or solid sound. Pretty happy with my progress, I decided to stain a length of lazer cut and engraved 3 Ply which had been laser cut by Tristan from Chilli Laser Engraving. This will be used for another wooden road over rail bridge over the Clubroom HO Layout. I then threw my attention to looking at what was needed to be done to lay the next two lengths of code 83 rail in Acacia Ridge Yard on the dual gauge track. I think I have come up with a clever way to roughly lay the track. Cut up a section of old plastic rail sleepers, cut them up individually and then cut then in half. Use the plastic chairs to hold the third rail in place every three to four inches or so. nail the sleeper to the baseboard at the required location. Then use nails to hold the rail more securely in place at intermediate locations. In this scenario, I am adding the standard gauge rail to lengths of narrow gauge track. It is also possible for this to be used to adding the third rail to a length of standard gauge track. Then after you have fitted the rail, run your vehicle over the track and check for under or over gauge locations. Then make minor adjustments. I use some Eureka wagons as my test vehicles as they have the narrowest wheels. I got a phone call from a mate on Friday afternoon and quickly arranged a visit from Royalty. Rohan Ferguson from Bolivia fame gave me a ring out of the blue as he was down the Gold Coast visiting his daughter. So addresses exchanged and about an hour later he rocked up at my place for a tour of the empire. 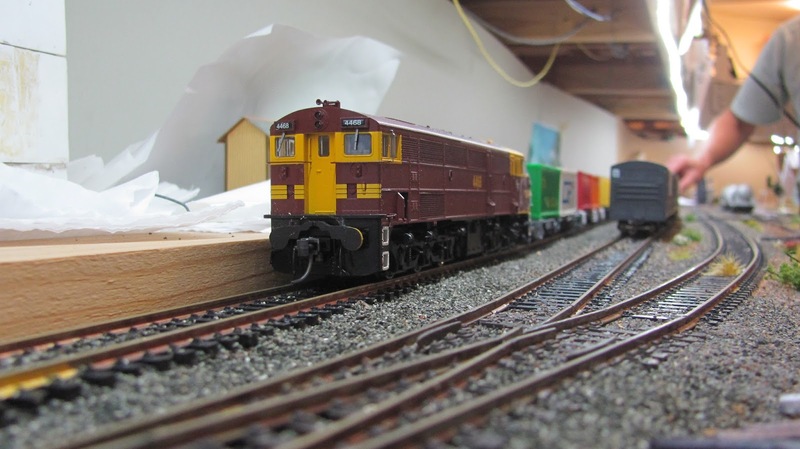 Rohan produces some absolutely brilliant scenery and his rollingstock is not too bad either. It was good to have a quick 60+ minute catch up with him before he had to return back down the coast for the weekend. Other than that, my weekend consisted of taking my son to cricket on Saturday morning (with that getting washed out), followed by a trip to the Train Club from lunchtime for our monthly meeting. While at the Club, I had to nominate my modelling competition entries for next month's Christmas competition. So I currently have 4 entries arrange. Maybe sometime in the next 4 weeks, I might have to finish two of them off and fix up something that is broken on a third. Today entailed a midday trip to Suncorp Stadium - the Cauldron, as my son was running out onto the field to play a game of 4 vs 4 in the half time break of the Brisbane Roar vs Perth Glory game. Actually his class mates played two games simultaneously, one at each end of the field. I did however get down to the shed this morning for about an hour. I was cutting up some wood for the new lights to go above The Risk. I realized this morning, that I needed to buy some screws in order to attached the next 5 light brackets to the shed frame. I will pick them up next week so I can complete the lights. I also did a bit of work adjusting the nails in a couple of sections of track at Acacia Ridge Yard and also in Grafton Yard. So I have decided to show a few photos this week. One is the back yard during the storm that hit two weeks ago. I have also included a few photos of the year 5 kids at Suncorp Stadium this arvo. The back yard during the Storm. Half of the kids running out. Kyle just scored in front of 11,748 spectators. A great cross from Kyle and team mate planted that one in the back of the net. His team mate is already celebrating. The photo for posterity purposes.